The attack took place in Orakzai, described by Barack Obama as ‘the most dangerous place in the world’. At least 31 people were killed and 50 wounded when a bomb hidden in a carton of vegetables ripped through a crowded marketplace in Pakistan’s restive northwestern tribal region Friday, officials said. Shahbaz Ali, a resident who was buying food in the market, said he had seen a boy with his face covered ride up on a motorcycle. “Suddenly a blast took place and then I was unconscious,” he told AFP. Senior official Ameen Ullah said 31 people had been killed, including 22 Shiite Muslims. More than 50 people were wounded, with 17 of them in critical condition, he said. Tribal police confirmed the toll. 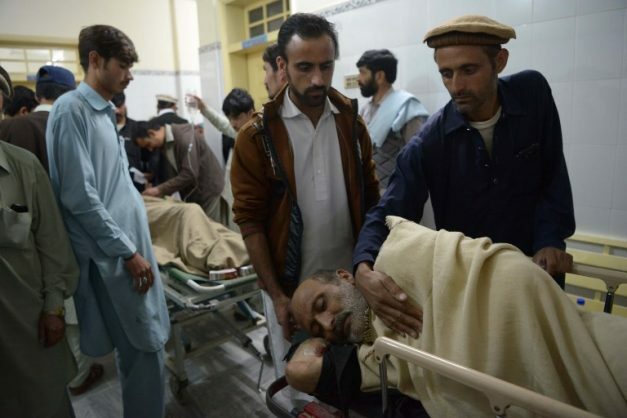 Many of the wounded were taken to a hospital in Kohat, a city in neighbouring Khyber Pakhtunkhwa province, where doctors said all staff had been summoned to the trauma centre. Ambulances could be seen outside the hospital, where relatives were awaiting news of their loved ones. One man was searching people before they entered the building, a precaution against a secondary bombing targeting hospital staff. “We have received one dead body and 28 injured, three of them were serious and taken to Peshawar,” Fazl Ur Reham, deputy medical superintendent at the hospital, told AFP by telephone. Six other wounded were undergoing surgery, he said. Most of the injured had been hit by ball bearings and fragments of the bomb. “We expect more injured from the site,” he added. Orakzai is one of seven restive semi-autonomous tribal regions on the Afghan border, an area that has long been a focal point in the global war on terror and was famously described by Barack Obama as “the most dangerous place in the world”. Washington has said that the mountainous region provides safe havens to militants including the Afghan Taliban and Al Qaeda — an allegation that Islamabad denies. Pakistan, which joined the US war on terror in 2001, says it has paid the price for the alliance. It has been battling Islamist groups in the tribal belt since 2004, after its army entered the region to search for Al-Qaeda fighters who had fled across the border following the US-led invasion of Afghanistan. Security has improved in the region in recent years, though lower-level attacks are still carried out with devastating regularity, often targeting Shiites in the area. Residents also complain of undue harassment by security forces, citing disappearances and extrajudicial killings. Earlier this year Pakistan passed legislation which paves the way for the tribal areas to be merged into neighbouring Khyber Pakhtunkhwa province, bringing them into the political mainstream.